This Northside Alley cuts through the most interesting section of the neighborhood. Traveling between Hamilton Avenue and Fergus Street, Pope Alley crosses four alleys within its two block span. The neighborhood rivals even OTR for the most alleys. They contribute to a walkable environment, by connecting its deeply residential areas to the business district. But this was not always the case. Their clean and navigable state can be attributed to the neighborhood Citizens on Patrol team, which participates in the Adopt-a-Spot program. In 1999, the Wasted Spaces Campaign worked to address Northside’s alleys, which were littered with white goods, litter, and cinder blocks. 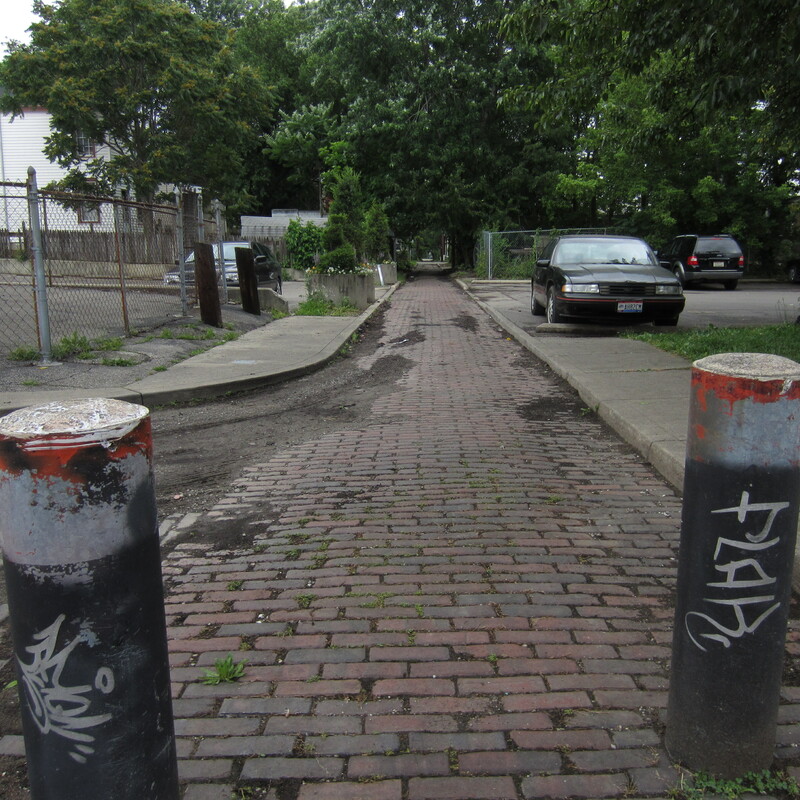 Area drug dealers often block alleys to deter the Cincinnati Police (CPD) bike patrols. In a cooperation between CPD and Silver Hammer Workshops, school children were equipped with tools necessary to remediate them. Notable challenges: Lighting is relatively poor along Pope Alley, during the evening hours, especially east of Langland Street. Recent activity: Titled “Piazza Pope to move Pope Alley’s brick pavers up to street level, per recommendation of Bob Sala, President of Northside Business Association. According to retired city engineer Jack Martin, this type of action enables vehicles to traverse the alleys. But they can also create additional opportunities for outdoor dining and other setups. Madison’s Market, the current site of Market Side Mercantile, once had sorbet window facing Pope Alley. The section of Pope between Hamilton and Ingol Alley has been restricted by bollards, providing pedestrian-only access for the rear parking lot. Opportunities for improvement: Pope Alley is not dissimilar to Schorr Alley, as it connects a core neighborhood area to the business district. Additional lighting would provide a better perception of safety and awareness among residents. Pope Alley has a paved width of about 10 feet, while at least two to three feet on both sides for its entire length. Inexpensive seating could be placed throughout the alley. The complementation of native, low-maintenance shrubs or hardscape planting beds could transform the alley corridor into a linear park. 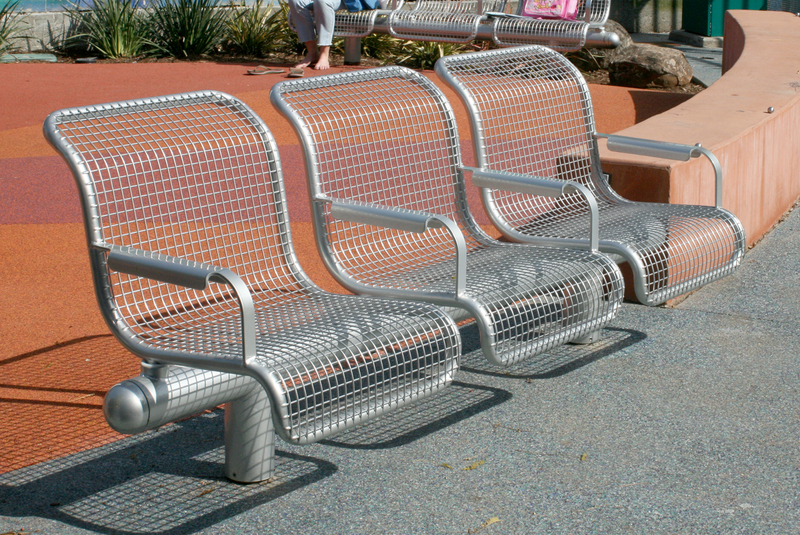 This bench with armrests could be a non-intrusive, complementary seating option for Pope Alley. The wire scheme would allow for quick dry time from participation. Armrest dividers typically discourage sleeping or loitering over long periods. We envision Pope Alley as a linear park with seating areas throughout. The area bollard bounded section between Hamilton Avenue and Ingol Alley could reflect the piazza atmosphere that Northside Business Association seems to desire. But partitioned bench seating along its sidewalks, along with ornamental LED lighting, has potential to connect the business district to a viable public space. Jacob Hoffner Park offers various amenities at the corner of Blue Rock Road and Hamilton Avenue. But a quiet environment away from the traffic noise could just the thing Northside would embrace. 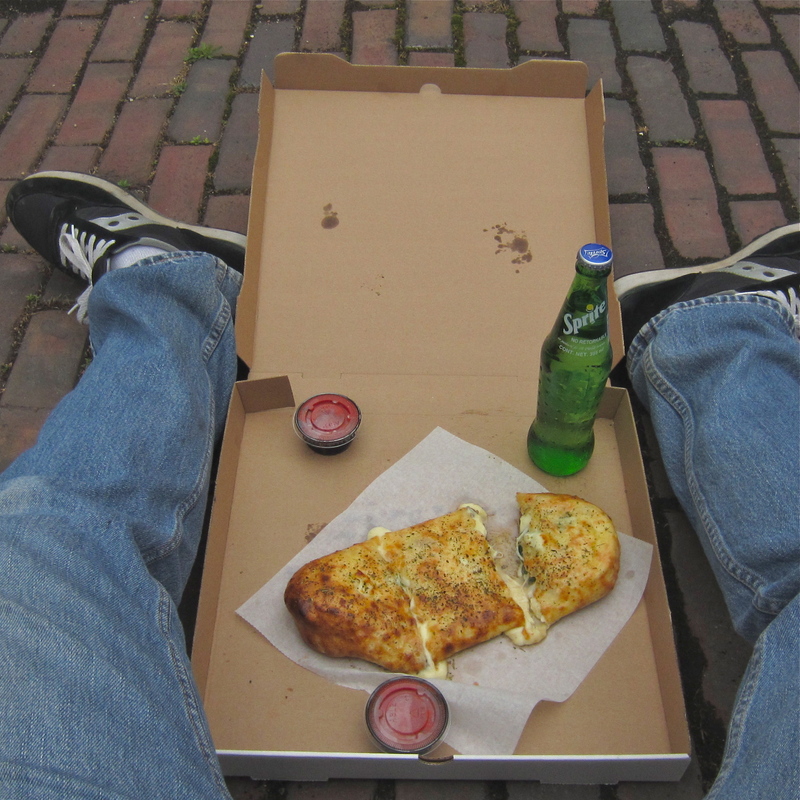 Many eateries offer meals to go, within a block in each north-south direction, and Pope Alley could be the place for small group chats over delicious food and people watching. This entry was posted on September 19, 2012 by C. Huelsman in Alleys and tagged alley, northside, piazza, popealley, seating.